Sincere condolences go out to the earthquake and tsunami victims in Japan especially to our local Asian community who may have friends and family affected by this natural disaster. APAS as the umbrella organization for our Asian community will assist the Japanese community with their efforts to raise funds for the victims in Japan . APAS encourages that its community members and any other organizations who have an interest in coming together to raise awareness and funds to please contact the Executive Committee so that we can collaborate our efforts. The Greater New Orleans Foundation, with the guidance of the local Japanese organizations, will distribute these proceeds toward a local Japanese organization in an affected region/city. Or at http://www.japanclubofneworleans.org by clicking on Contact Us. Trying times like this is what defines our strength as a community. 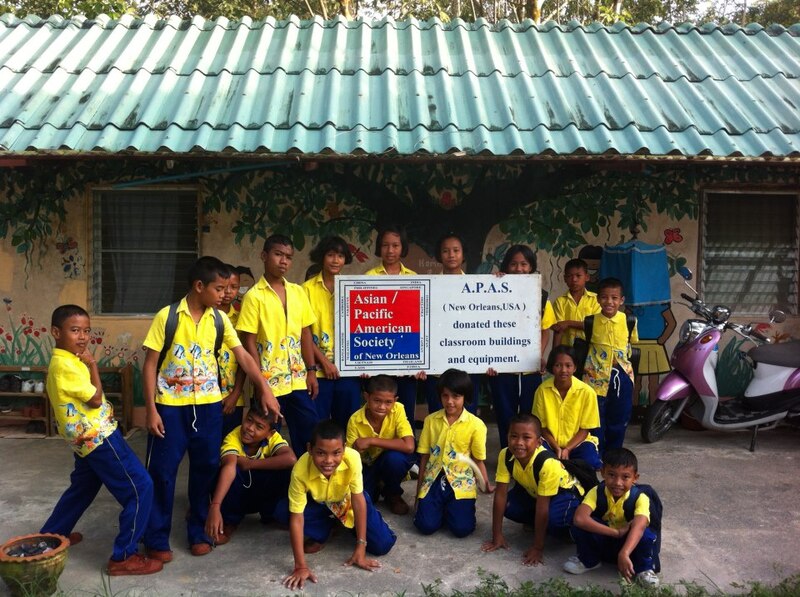 When the 2004 Indian Ocean earthquake and tsunami ravaged southern and southeast Asia , APAS jumped into action. Through its generous members, the general public and with the help of United Way and Freeport McMoran, nearly $.5 Million was raised for the APAS Tsunami Relief Fund. One of the many great projects APAS assisted with is an orphanage in Kao Lac , Thailand, called Home and Life, which now houses 20 children orphaned by the tsunami. We also donated computers to the Baluga School in Phuket, Thailand , which was another program directed at serving tsunami orphans. APAS' point man for those projects was Mr. Pong Chongchit. He was instrumental in helping APAS identify programs and in making sure that our members' funds were handled with great care. It is fair to say that the Thailand programs could not have been done without Mr. Chongchit's assistance. APAS has learned that Mr. Chongchit has continued his good work on behalf of tsunami victims. This video is in promotion of a book authored by Aaron LeBoutellier regarding his experiences in the tsunami. Of course, there are hundreds of such books on the market now, but Mr. LeBoutillier's is different in that he will donate his profits to the Thai victims of the tsunami. He has pledged to work with Mr. Chongchit's Thailand Tsunami Education Center to aid tsunami orphans. Please join APAS in raising funds to build a center and for the Disaster Relief Fund. The Hookah Caf will donate a percentage to APAS for every drinks purchased between 7pm and 10pm. Please join us at the information below: Date: Tuesday, June 3, 2008 Time: 7:00pm to 10:00pm Location: Hookah Caf at 500 Frenchmen Street , New Orleans LA If you cannot join us but would like to still donate, please send check or money order the following information: APAS 3500 N. Causeway Blvd STE 1548 Metairie, LA 70002 Please indicate on the subject line: " APAS Cultural Center " or "APAS Disaster Relief Fund" In addition, direct deposits can also be done at the APAS Disaster Relief Fund at Chase Bank. As you all know, the Sichuan Earthquake in southwestern China caused massive casualties. The death toll can be over 50,000. The devastation is much worse than it was expected. The energy release from this earthquake is over ten times of the 1994 Los Angeles earthquake. Louisiana Chinese American Society (LACAS) has set up a disaster relief fund at Chase Bank. Please send emails and words to all the Asian and mainstream communities to give this fundraising more publicity. To last night we have collected about $6000 including Tulane students' donations. 1. Make check payable to: Louisiana Chinese American Society: China Earthquake Disaster Relief Fund. We will send every penny to China Red Cross to be used for the disaster area. We will provide receipts to all donors. We will publish the names of the donors. Please send your check to: Dr. Xiaofeng Hu, her address is: 1430 Tulane Avenue , SL-31. Hayward Genetic Center , New Orleans , LA 70112 , or drop at Tulane Medical School , 5th floor, Hayward Genetic Center . 3. Donate through USA Red Cross. You might have heard that a powerful earthquake (7.8!!) occurred on May12 in western China, which caused massive casualties and severe devastations to the area. We need your donations to support the disaster area. Please send your donations to Dr. Xiaofeng Hu, her address is:1430 Tulane Avenue, SL-31. Hayward Genetic Center, New Orleans, LA 70112. Please write in your check paying to: Louisiana Chinese American Society, Earthquake support fund. We will send all the money through Chinese Red-Cross to the disaster area. Thank you very much for your support. My cell phone number is 5048134983. In the aftermath of the Asia Tsunami that stunned the world in December 26, 2005, APAS of New Orleans was able to raise a total of $450,000 dollars. After much consideration and research, APAS developed a non-biased formula distribute funds accordingly to each country. The formula took into account the human impact (# death, # missing and # displaced), economic impact (amount estimated to cost the country to rebuild) and direct observation by the APAS chair at the time. Each community was then informed of the process and voted on the numbers. Each community was also requested to identify projects that would benefit from these funds. The Prime Minister’s Child Assistance are funds to assist tsunami affected children when they turn 18 for further studies or self-employment. The Prime Minister’s Scholarship for Tsunami Affected Children who will receive assistance for school-related expenses for the next ten years. The Psycho-Social Support provides social infrastructure, and social development, such as Old Age Home, a sports complex, a trauma center, and rehabilitation center. Universal Health Insurance provides health insurance coverage to families for the next three years. Support to Fishermen and Loans provide funds low interest loans to fishermen affected by the tsunami to help them get back on their feet. THAILAND: The Thai community indicated in the Island of Phuket, many schools were still in need of assistance. The Thai government immediately placed many displaced and orphaned children in the School for Life in Phang Nga, which is adjacent to Phuket Island. This school built an additional complex/room to house computers for instructional purposes for children and used as research purposes for the community. The structure itself was funded by other donors and APAS bought computers to fill the room. Recently, APAS allocated the rest of the funds designated to Thailand to the funded the Home & Life Project and the Tsunami Volunteer Center. The Home & Life project house up to twenty children who were orphaned due to the Tsunami. The Volunteer Center is a non-profit organization that house volunteers who travel to Thailand at their own expenses and are committed for two months to provide free skilled and unskilled labor on Tsunami relief projects identified. One of the Projects APAS supported in its 2004 Asian Tsunami Relief program was an orphanage in Pang Nga, Thailand called Home and Life. When we met home and life, they were just getting started. We assisted them in building their first dormitories for the children, and in securing the land that their orphanage was on. At the time they had 15 kids all orphaned by the tsunami. They have since built a bakery and coffee shop on site, where they teach the kids skills they can use later in life. They are somewhere near 25 children now. They keep in touch with APAS, and although literally thousands of volunteers have come and gone over the last 6 years, they have always expressed great gratitude for the help APAS gave to them in the beginning. The bakery and orphanage start to show up around the 6 minute mark. The couple that run the orphanage are doing a fine job. The video is a little long, but worth in to see how happy and healthy these children seem to be, despite a rough start in life. While all of the credit for that goes to the wonderful people that are there every day, APAS can take great pride in their success as well, knowing that we gave a useful nudge in the beginning. Watching this video makes me proud to be an APAS member. Micro Financing: This project provides small low interest loans to 23 small businesses to rebuild their businesses. Building semi permanent homes: The funds for this project goes towards building semi permanent homes in the village of Punge Jurong in Indonesia. These homes can last up to ten years while the families are rebuilding their lives. Building of Community Center: This community center will provide opportunities for villagers young and old to use for training or educational purposes. 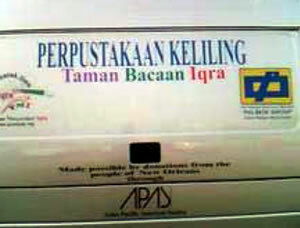 Mobile Library Van provides access to literature to school children. This mobile library rotates between different sites affected by the tsunami to give children opportunities to have access to literatures and human interaction with volunteered story tellers. Ya Ya San Nurani Dunia- A project to build a dormitory for female university students. SRI LANKA: Ten homes were built for families who lost their homes to the tsunami in Sri Lanka. These homes, along with the land, would be owned by the occupants. It is the fruit of networking. Realizing that small initiatives need to be strategic and focused, ARF utilizes a vast network in and outside Aceh to fundraise and deliver its programs . Reading Society Foundation (www.acehkids.org) and 1001-Books (www.1001buku.org) are among the two very active partners of ARF in Indonesia. On the other corner of the world, well, at least the other corner of the US, Asian Pacific American Society (APAS - www.apasneworleans.com) of New Orleans, with the help of United Way and other agencies have raised over $440,000 tsunami donation in New Orleans greater area by April 2005. APAS is a unique and strong community organization. It is a real melting pot of communities from Asia and the Pacific regions--some already naturalized, some others are students or professionals with temporary residency statusundefinedin a famous city of New Orleans, Louisiana.